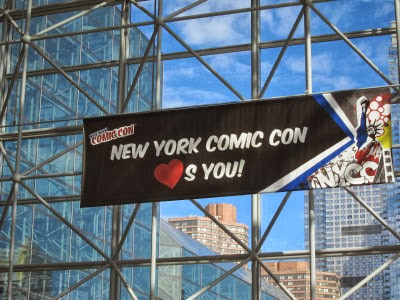 The 2013 New York Comic-Con was, by all accounts, bigger than ever, and I was lucky enough to receive a professional pass for the show, which now takes up four days, including an extended "preview" Thursday. My work schedule meant that I couldn't make it for the entire show, so I drove out to eastern Pennsylvania on Friday evening and made my way into New York City on Saturday, October 12th for one of the country's largest comic and pop culture conventions. I took a number of pictures, some of which I'll share today and a few more times in the days to come. Let's begin! Parking in New York City is obviously outrageous (in 2010 it was $50 per day), so I drove to Newark and took a train into Penn Station. I wasn't the only one who decided on this route, as I was accompanied on the train by the Blues Brothers. They looked like they knew what they were doing, so I followed them through the maze from Penn Station to street level to the convention center. Upon arriving from underground, there was a famous landmark or two to take in. The way to the convention center, along 34th street, was easy enough to follow because the way was lined with folks in costumes. Even so, there were convention workers in bright orange shirts along several street corners, directing the human traffic toward their destination. As a perk of having the professional pass, I was allowed to enter through a side entrance. There were a handful of others entering at the same time I was, but there were no lines to speak of, and I basically walked right in. My badge was scanned and I successfully managed to make it to NYCC without getting killed! Very exciting. There was lots to see upon entering, and for a while I just wandered around, looking to see what I could see. Eventually I made my way to the artist alley section, which was a little out of the way, so I could get to the FUBAR booth. I wanted to say hello to the guys working there, and I selfishly wanted to drop off some of the things I was carrying. Along the way I saw this person dressed up at Ragdoll from the Secret Six. 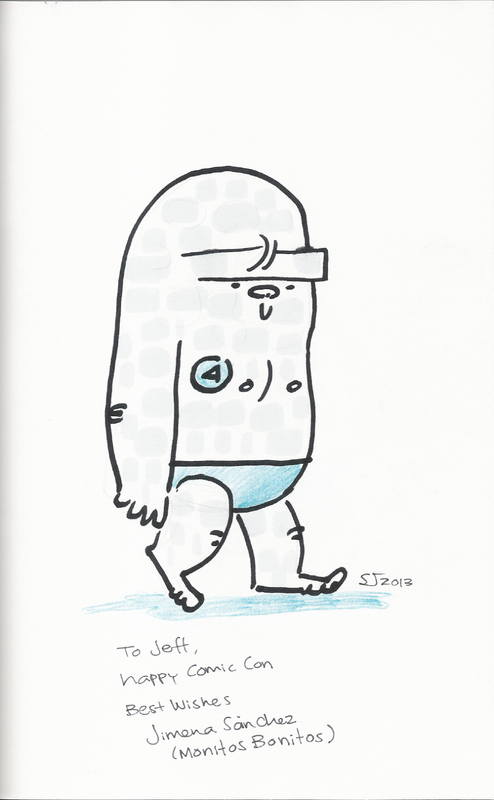 I talked to the FUBAR guys for a while, and got a peek at Dom Vivona's personal sketchbook. He showed me this great illustration of the Tick, reminiscent of the early Edlund work. Very cool! I eventually made it back to the convention floor, where I saw the First Second display. I walked up and bought the recently released Battling Boy, which I was looking forward to, when someone asked if I was in line for the Paul Pope signing. I had no idea what he was talking about, but I soon found out that Pope was making an appearance soon and, from where I was standing at the booth, I was accidentally around seventh in line. I kept my impromptu spot and soon I was able to get the copy of my book signed by Pope himself. I also landed a number of promotional items, all of which I'll show off a little bit later. It was a lucky score for me. I was pretty excited to see Nick Fury's flying convertible in the new SHIELD program; so far it's been a highlight from an otherwise mediocre production (pick it up, Whedon!). Having a car at the convention was a nice touch as well. Since I've taken in some episodes on Netflix, I've come to appreciate Bob's Burgers for what it is. Here's some younger costumers at the show. And here's a slightly more modest Molotov Cocktease from the Venture Bros.! The accessories obviously make this costume. Some '90s, cartoon-era X-Men. What's that guy in the bottom right got going on on his iPad screen? A few "Age of Apocalypse" X-Men! And...Lady Deathstryke, I think? Teams were a big focus of a lot of costumes on Saturday. I wonder if these were groups who came together, or individuals who found each other at the con and decided to take advantage of a good thing. This '80s era Justice League did a nice job. And here's a group of Fantomex characters...and Vision...and...Waldo. Okay. Lots of cool things to see at NYCC. I'll post more pictures soon! 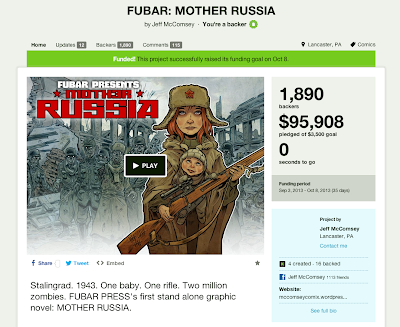 FUBAR has enough going on that it requires its own section of RANDOM NOTES! 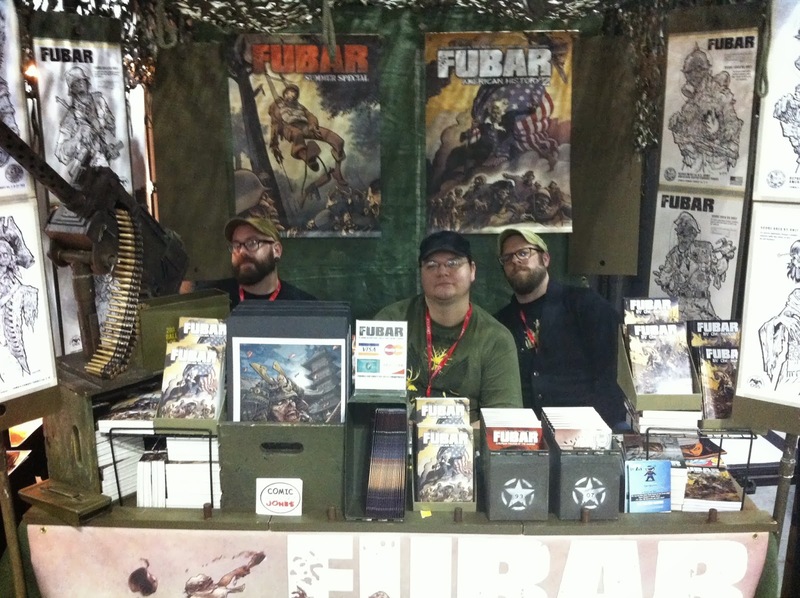 To me, I think that FUBAR represents the best of what independent comics (and comics in general) can accomplish: a lot of different, talented people from all over coming together to tell fun stories on a regular basis. The formula is difficult to sustain; having a regular creative team on a book comes with its own challenges, but an anthology, with all of its moving parts, can easily get bogged down in a "too many cooks" situation. 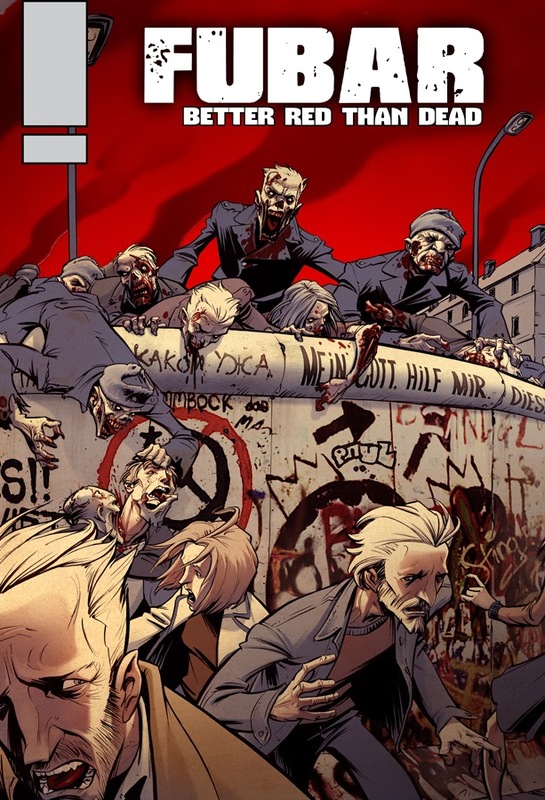 For whatever reason, FUBAR has bucked that trend and is moving along at a faster pace than ever before, and there are some new developments that should propel the book and concept into 2014 and, hopefully, beyond. 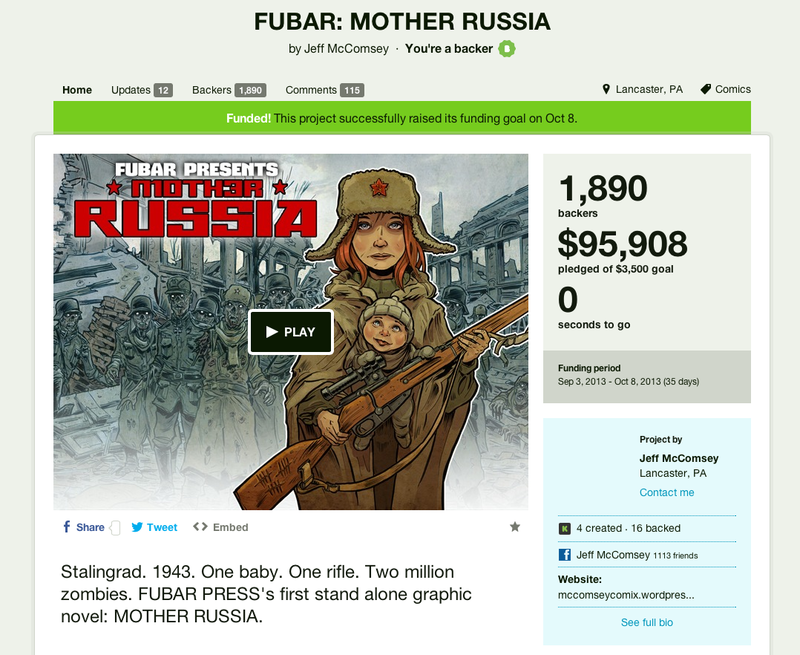 The latest news has to start with the final tally for Jeff McComsey's outrageously successful Kickstarter campain, which will bring us all the anticipated "Mother Russia" original graphic novel and a few other projects. As you can see from the image above, there were almost 1900 backers, nearly all of whom ordered at least the book itself. In terms of independent comics, selling this many books right off the bat is a huge success, one that we're all looking to build on. 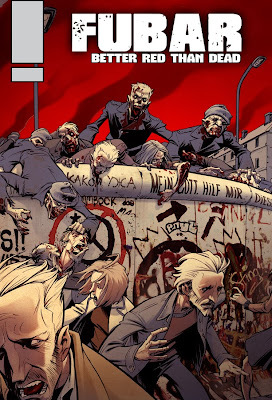 One of the projects springing from this campaign is FUBAR: Better Red than Dead, a short anthology that'll be written by McComsey and me. It, of course, takes place during the Cold War period and features a knock-down cover by the great Pietro. This book will ship out to all Kickstarter backers who pledged at least $25 to the campaign, and I believe it will be offered to comic shops and at conventions at a later date. 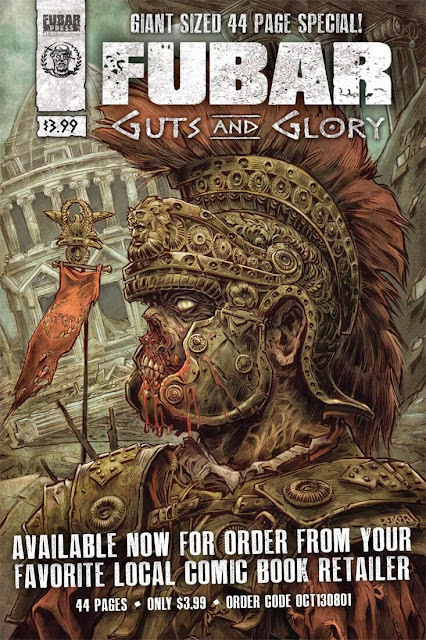 The book soon to be on shelves is our new Guts and Glory feature, with stories taking place in earlier times, as the Steve Becker cover suggests. This book will also ship to Kickstarter backers, though it'll show up in comic shops first. As a matter of fact, it's available to order right now, with a Diamond order code of OCT130801. Similar in format to the two By the Sword issues, I've got a story in this issue title "I Am". Lastly, Swedish artist Daniel Thollin posted this picture recently of a magazine interview he gave. Thollin has worked on a number of FUBAR projects, including the "Old Ghosts" story story that I wrote for volume two of the series. You can see the book in the extreme foreground of the publicity shot, which is fun to take note of. 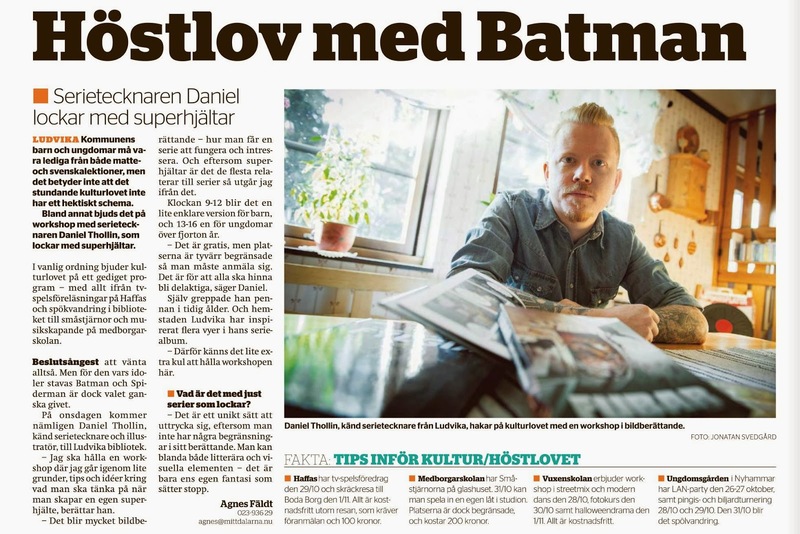 I don't speak Swedish, but I'm assuming that the article headline outs Thollin as the Batman of Sweden, which, let's face it, I kind of already figuerd. Another desktop-clearing session of RANDOM NOTES! 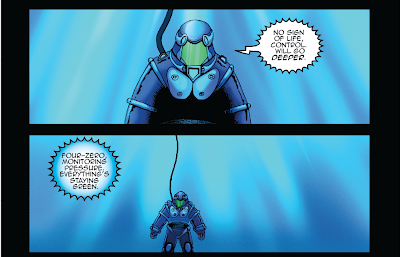 Fantastic Four #48, the NFL's Thing, Futurama/Adventure Time and more! It's time for more seemingly random, semi-comic book related notes that don't deserve their own post! They may think they do, but they don't. Don't feel bad for them. - I made it out to an estate auction this weekend because I heard that there were some comics on the block. When I die, I wonder if my possessions will be picked through by hungry crowds looking to get a good deal on a box of a dead guy's socks. I guess I won't care at that point, but hey, maybe I'll inspire a nephew or crazed fan to keep all of my collection in tact. Maybe I'll get a museum wing or something. Anyway, I managed to get outbid on just about everything I wanted, but I did come home with about 20 or so comics, including this gem, for a great price. This copy of Fantastic Four #48 is not in the best shape, but it's not a piece of crap either, and its covers contain one of the most famous stories of the entire silver age of comics. It's the first appearance of Galactus, the Silver Surfer and the Watcher, and I'm happy to add it to my collection. It's got a date stamp on the cover, which is unfortunately not uncommon for books of this era, but at least it doesn't have the damn guy's name scrawled across the top, as was the case with many of the other books I brought home. - The Thing made a more modern appearance at the recent Steelers/Bengals tilt, captured here via the magic of...a camera phone. Everyone knows, of course, that the Thing is actually a Jets fan, and that no one is a Bengals fan, but you do what you can in Cincinnati. I especially enjoy the girl in the bottom left corner, who, as a Steeler fan attending a losing effort, is apparently puking all over Bengals fans. Good job, lady. The great Steeler comeback is underway. - I did some dressing up of my own recently. 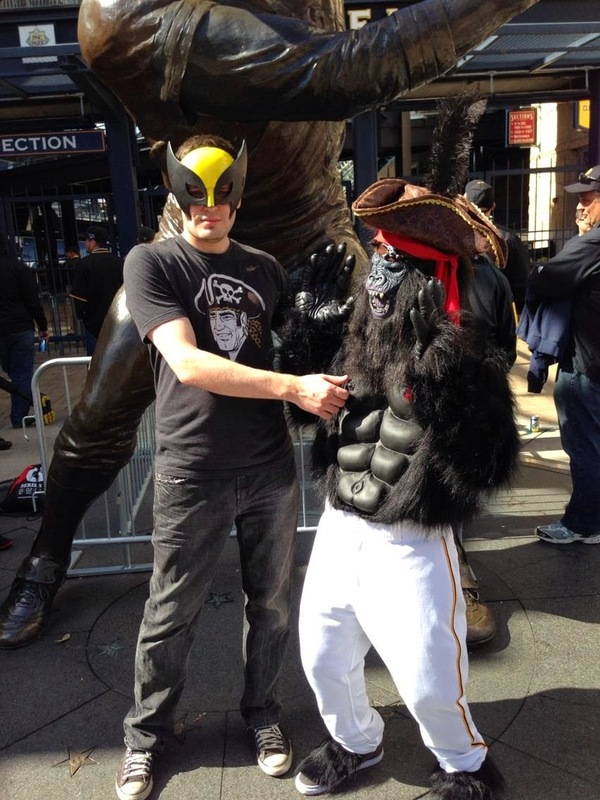 Years ago, I had vowed that if the Pirates ever made the playoffs again, I would attend a game dressed as a gorilla dressed as a pirate. That time was the 2013 season, so I had to oblige the fates. I'm seen here with Wolverine, I think. - Futurama's last episode has aired on Comedy Central, and the show is once again on hiatus until it the inevitable resurrection. I refuse to believe that it is gone for good - hopefully 2014's Simpsons/Futurama crossover episode paves the way for new episodes in 2015. I have hope! 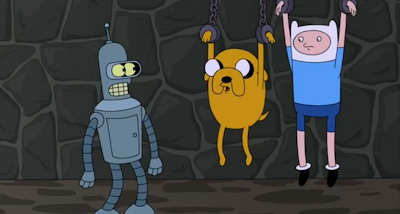 The most recent season had lots of highlights, but one of my favorites came in the form of a well-placed Adventure Time cameo, precipitated by the fact that both Bender and Jake are voiced by John DiMaggio. - DC Comics has released a short animated video celebrating the 75 years of Superman. It's got some real inspiring moments and, overall, it hits on a lot of the memorable points in Superman's history. If you haven't seen it yet, it's well worth the two minutes it takes to watch! That being said, the video probably focuses a little too much on the last 20 years, and it leaves out some fairly important parts, namely Crisis and the Byrne '80s relaunch, as well as, oh yeah, CLARK KENT'S MARRIAGE TO LOIS LANE. As much as DC is trying to sweep all relationships under the rug these days, that's still a huge part of the history of Superman. 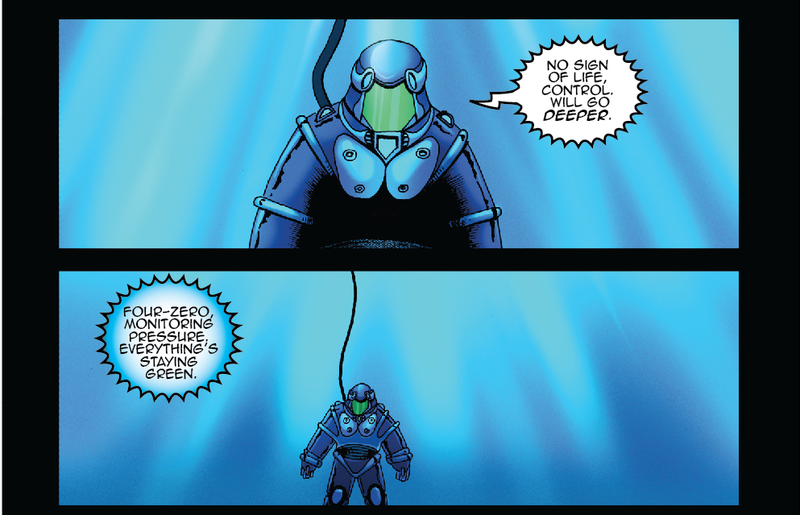 - I recently lettered a short sci-fi story titled "Diver Down" for fellow FUBAR contributors Mark Bertolini and Carl Yonder! I have absolutely no idea what the plans are for the story, but it was fun to work on. - Aaaaand finally, the always helpful SDCC blog has a post that compares Comic-Con International to the recent New York Comic-Con. Both shows are fun but nothing compares to the big boy in San Diego, in my opinion. 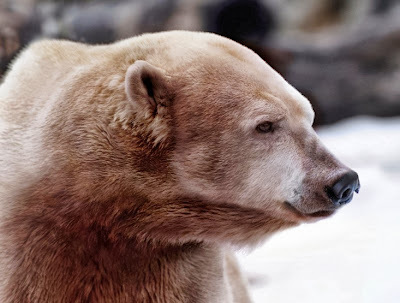 Read the article and decide for yourself! Man, this session of Random Notes was a lot of fun. I think I'll write another one, just for FUBAR, soon. Although it might have to be titled "Specific Notes", then. We'll see. 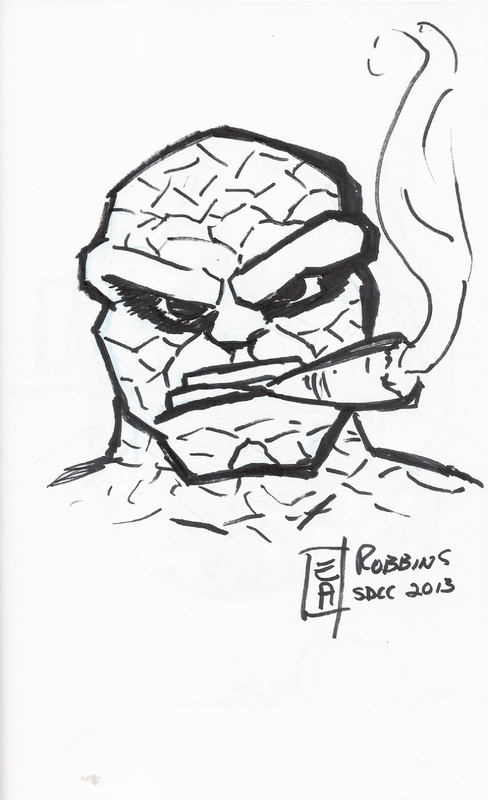 The Thing sketchbook took a trip to Comic-Con with me this year, and there are some great entries to show. 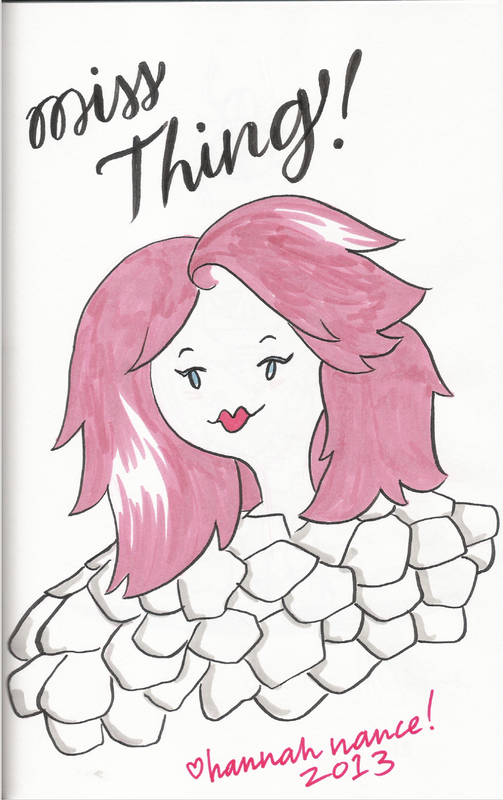 Here's the 13th installment of the Thing sketchbook! Liz Robbins is, along with husband Benn Robbins, part of the Robbins Studios creative team. Liz worked on the Mangalicious Tick series for New England Comics a few years back, and I had the pleasure to spend some time with both Liz and Benn at this year's Comic-Con. Always the opportunist, I believe that I've now grabbed sketches from everyone possible at the NEC booth and I'm happy to round out the rotation with Liz's entry. 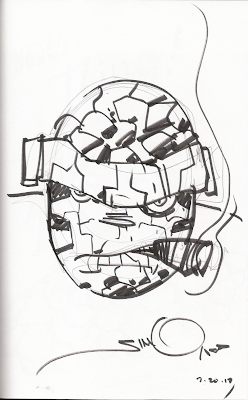 Also, the Thing's cigar in this image kind of looks like a carrot. Walter Simonson is a comic legend, and even though he might be best known for his memorable, lengthy run on Thor for Marvel, he also had a brief but action-packed and all-around incredible run on the main Fantastic Four title around the mid-300s. Walt has come back to comics in recent years and I couldn't be happier for it. I saw him signing and sketching at IDW's booth on Saturday of the show and immediately approached him - but as luck would (or would not) have it, he was packing up to leave the area. Interestingly enough, he was just heading back to his artist alley table where I soon met up with him again and landed this undeniably Simonson-esque Thing sketch. I've always been a fan of Simonson's signature as well, how it forms a dinosaur with the letters of his name. An extra treat! Hannah Nance Partlow is a comic book designer and letterer who, in recent months, has worked extensively for BOOM! Studios. 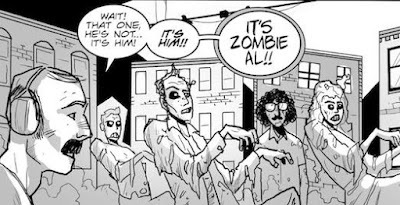 She also lettered the short "Zombie Shark" story for me, so when I found her at Comic-Con, I knew that I had to get some of her work in the sketchbook. 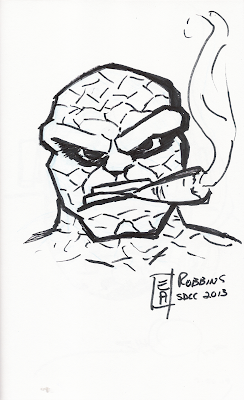 I asked her for a specific sketch, one of the new "Miss Thing" character from the Fraction/Allred FF title. Miss Thing is a model girlfriend of Johnny Storm who...puts on the Thing suit. She takes her place in the Thing sketchbook alongside the one image of the She-Thing! On the last day of Comic-Con 2012, I went around the small press section and bought a few books that caught my eye; one was a collection of strips from the webcomic "Welcome to Falling Rock National Park" by Josh Shalek. In 2013, I found Shalek again and got him to add this unique sketch into the book. 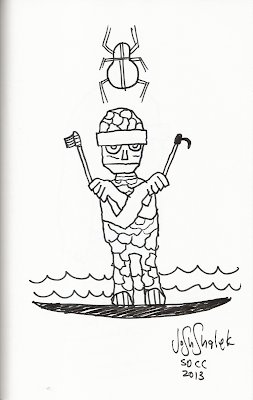 Josh had a few new comics available at the time, including one that I bought called "Dancing with Jack Ketch" and another with an ancient Egyptian theme, which inspired this Pharaoh Thing. On the last day of Comic-Con, I found Jimena Sanchez and Lesley Vamos in the small press section and was impressed by their collaborations. Sanchez is from Mexico and Vamos from Australia, making their partnership cross-continental in nature. I bought a few things from them, including a book of postcards titled "From Me to You", and was fortunate enough to get sketches from both artists. This first one is from Sanchez, and it features a cute, almost Charles Schultz-like Thing, complete with a "4" patch and light grey stones. This is an understated image but one of my favorites. More Thing sketches to come! HOW EXCITING! A new Frankenberry cereal comic! After years of slowly disappearing from the shelves, becoming more and more difficult to find, I'm happy that Frankenberry, Boo Berry and all of the General Mills Monster Cereals have been reappearing with some frequency over the last few years. I long for the day when I can go out and buy a box of Frankenberry on any day of the year as opposed to just around Halloween, but I'll take what I can get. It's a little bit inconvenient to store 20 boxes of cereal in your basement because you don't want to run out by March, but it's worth it. This year, General Mills even brought back Yummy Mummy and Frute Brute, which was an added treat. A few years ago, Monster Cereal boxes came with an honest-to-goodness comic on the back. 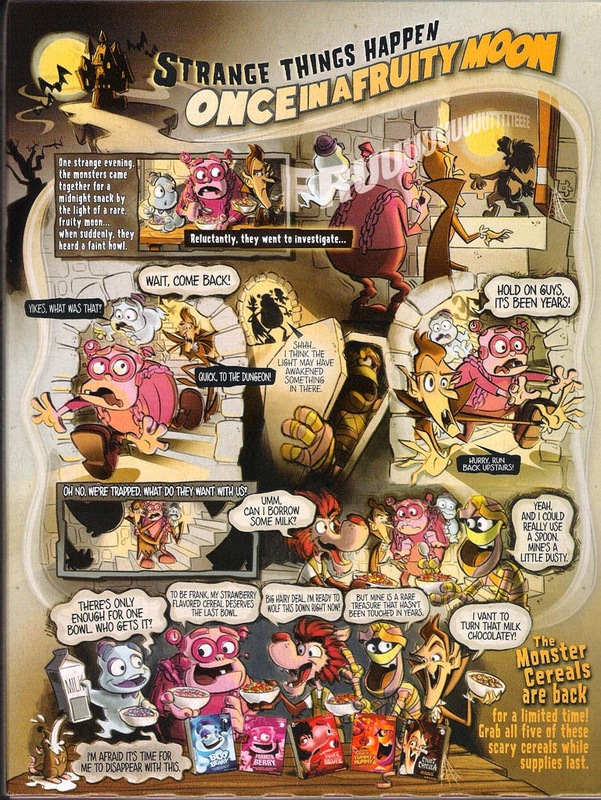 The comic ran for several years but was retired this year in favor of a brand new comic, still by an unknown artist, featuring all five cereal mascots. The artwork is fun and interesting. The image in the middle of Yummy Mummy is particularly well done. 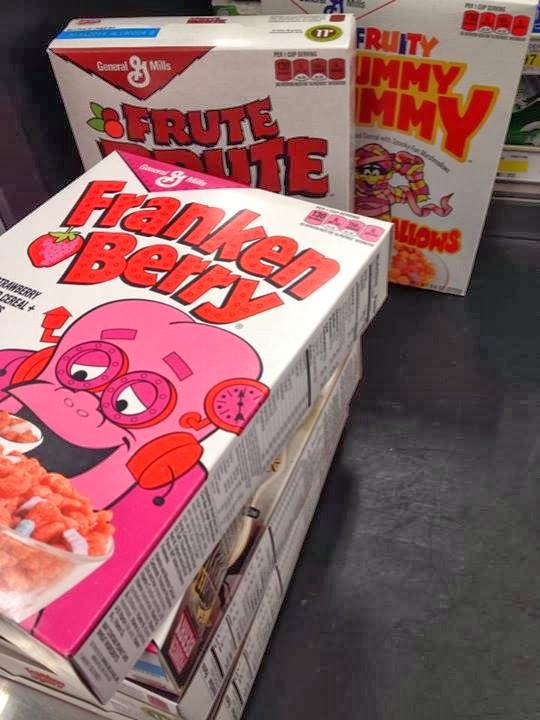 Dear General Mills: if you one day decide to produce a Frankenberry comic, I will totally write it, and I'll even accept boxes of Frankenberry as payment. Please make this happen. Target has these cereals stocked up and on sale, and in retro boxes, even. Time to stock up like I am. Friday night of the show was just about as dead as a convention of any repute could be. It makes me wonder if the Pittsburgh Comic-Con even needs a Friday anymore. In any case, it allowed me to stand in line for a great Barry Kitson sketch. Kitson has worked on a number of mainstream books; I first became aware of him from his early '90s work on Adventures of Superman. 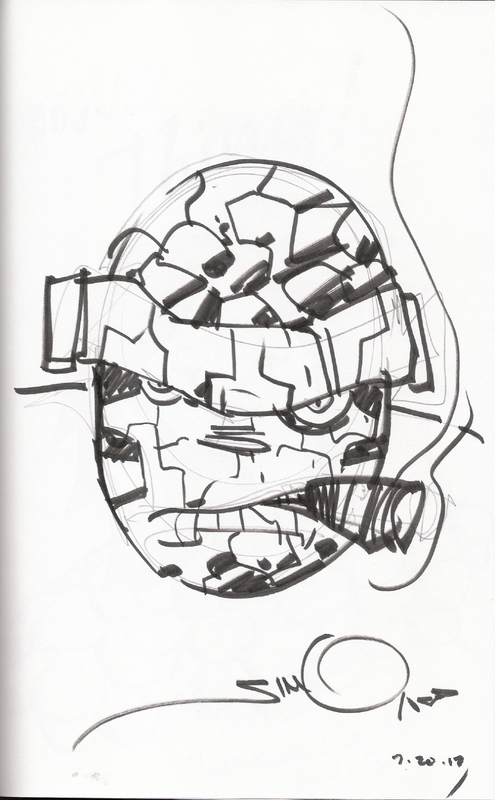 Recently, he drew a few issues of FF, which made him a prime candidate for the Thing sketchbook. Kitson doesn't charge for sketches, but he takes such care with them that there's only the opportunity for a handful at any convention. I began the show fourth in line, and waited five hours to get a sketch. It was certainly worth it, but it was a big time commitment. I'll post a nice scan of it in the coming weeks, but here's a shot of the finished work with the relatively giant Kitson himself! FUBAR chief Jeff McComsey and I had a panel about publishing small press comics - it seemed like a good idea especially for a small show like Pittsburgh's. Overall, I'd say that it went very well! There ended up being about 50 people in the room and it seemed to me that Jeff and I held everyone's interest for a little over an hour. Plus Carmen Sandiego showed up to hear what we had to say! Because I enjoy hearing the sound of my own voice, I filmed the panel and uploaded it to YouTube. I'll embed the panel here on the blog soon! There were a number of costumes to be seen at the show, especially on Sunday, when I believe you get in free if you wear one. These guys knew how to do it. I've seen these two ladies at the show before; in fact, one of them dressed as Quicksilver and one, I think, as the Flash the day before. They both do good work. This guy basically has the perfect build for an older Finn, and the beard looks just goofy enough to work. Princess Bubblegum and BMO are great as well! I saw this Chainsaw Vigilante costume at the previous Pittsburgh Comicon, were I was equally impressed. I chatted with her this time around, and I mentioned that I had shown her picture to CV creator Ben Edlund at the 2012 Comic-Con in San Diego (which I did). She was pretty thrilled to hear that. Looks! It's unfortunately-placed balloon animal Venom! Oops. Game of Thrones costumes continue to be popular. This girl did a nice job with hers. I have...no idea who the guys in back are supposed to be. Gendry and Hodor? No, that's not it. I'm stumped. This was a pretty elaborate concoction of the X-Men's Hank McCoy/Beast. The mouth even moved! Without a doubt, the best costumes I saw all weekend (I'm a little biased, but whatever) were these two - a real-life Frankenberry and Boo Berry couple! Incredible! We chatted for a while about the cereal and the costumes. They were a friendly bunch, but of course that goes without saying. The Frankenberry glasses were very well done. 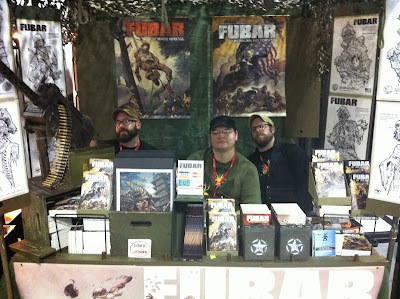 The FUBAR booth bumped right up next to the Wagon Wheel Comics booth for the weekend, and it was a nice treat to get to talk with Jeff McComsey and art director Steve Becker for a few days. They know how to set up a booth. On Saturday, someone brought over this hand made piece of FUBAR fan art! Jeff and Steve cranked out sketches all weekend long - this one was my favorite...zombie E.T.! I managed to snap a picture at the FUBAR booth before the weekend ended and I packed up to leave. It was a fun time despite some lags in attendance (which is something the convention will have to address at some point, I hope). I was able to meet some nice people, buy a few things and get some sketches. 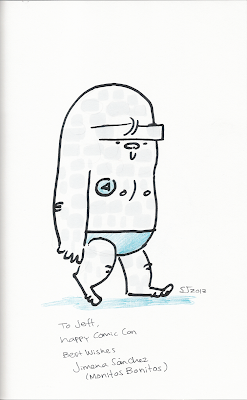 Now it's off to the New York Comic-Con, where I'd imagine things will be...a little bit busier.